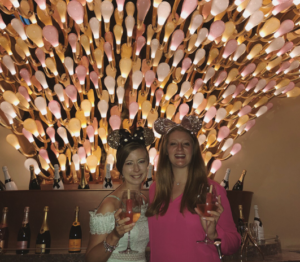 Small World Big Fun Agent Ashley Russell’s 22 year-old daughter recently traveled on a Disney Cruise with a friend, here is their recap of the trip! Sailing on Disney Cruise Line is not just for kids; it’s also great for the young at heart! From honeymoons to girls’ trips to couples wanting the best cruise experience, Disney Cruise Line has a lot to offer the grownups. Recently, I traveled to the Caribbean on the Disney Dream for a 4-night cruise with one of my friends for a girls’ trip. Serenity Bay on Castaway Cay. Disney’s private island, Castaway Cay, is always a highlight of a Disney cruise. For me, the best part was Serenity Bay, an adults-only beach. It was so quiet and peaceful that I took an hour-long nap! And, whether you just need water for hydration or a fun tropical adult beverage, plenty of bartenders are on hand to take your order while you lay on the beach. Serenity Bay feels like paradise to adult cruisers. Lunch is provided for everyone on the island, including in Serenity Bay, so you can still avoid the kiddos. The food was absolutely delicious! 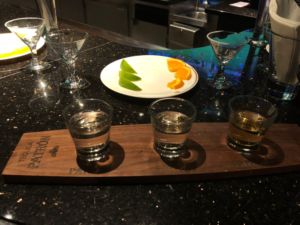 of my favorite activities on the cruise was an alcohol tasting. My friend and I decided to buy tickets for the tequila tasting since she loves margaritas and I don’t usually drink tequila. This class consisted of approximately 12 other people and a wonderful bartender who taught us everything about the making of tequila and the best way to drink it. After tasting different varieties of tequila, we even got to make our own margaritas! It was definitely BIG FUN! If you’re not a fan of tequila, you can choose wine, liquor and chocolate, bourbon, champagne, just to name a few. I will definitely be trying the champagne and wine classes on my next cruise! Rotating Dinner. If you are traveling with adults only, I definitely suggest the late seating for dinner. Fewer children are around and you can spend more time eating since the staff isn’t rushing to prepare for the next seating. Smaller parties are typically seated with other smaller parties at dinner which is fun because you get to meet new people from around the world! Going into our first dinner, I thought we may be seated with a small family since there seemed to be so many families on our ship. However, Disney Cruise Line puts adult-only groups together. My friend and I were seated with two couples from different parts of the country. I loved making friends and enjoying dinner with other adults on the cruise. I also enjoyed the way you rotate dining rooms but keep the same waitstaff. It was like eating in a different restaurant each night. The District. 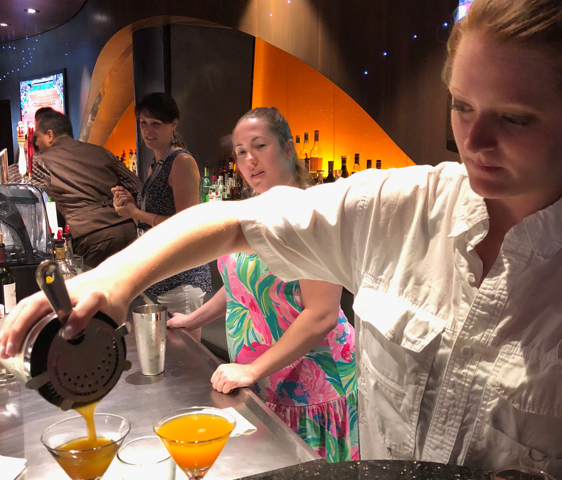 For adults who want a bar scene on the ship, go straight to the District on the Disney Dream. With four differently themed bars, you’ll definitely find something you’ll like. The bars are all close together and it is easy to travel to and from each one. My favorite was the Pink: Wine and Champagne Bar. The atmosphere is so chic with beautiful piano and harp music. This was a great place to come to grab a drink after the show and before dinner. My favorite drink at Pink was the Icy Pop, where a flavored popsicle was placed in a glass of champagne… Delicious! course, I grabbed one of everything. Thankfully, the serving sizes were small, so I didn’t feel too guilty. However, be sure not to load up on the buffet items because once seated with your plates of food, your server presents you with a menu to pick an entrée! The best part? You can order multiple entrees at no extra cost (personally, a recipe for disaster). I ordered parmesan crusted chicken and it was amazing! After stuffing my face with appetizers and entrees, it was time for dessert. 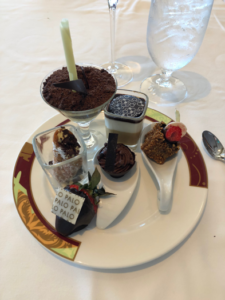 Our server escorted us to the dessert buffet, which was filled with various tempting treats, including Italian favorites such as tiramisu and cannoli. The servings were small, but you could definitely fill your plate enough to feed you for the entire week. Overall, my experience at the Palo brunch was absolutely incredible, and I highly recommend all adults make a reservation on their trip. A Safe Place to Wear Your Ears. Disney Cruise Line is the perfect vacation for the kid at heart. Even with all the adult-only areas and experiences offered, I still enjoyed walking around the ship with my ears on and going to the character meet and greets. There’s something about watching Mickey and Friends dance on deck with a drink in your hand and ears on your head. Bottom line, I highly recommend a Disney cruise for your next vacation, with or without children! « Meet Agent, Katherine Lu!